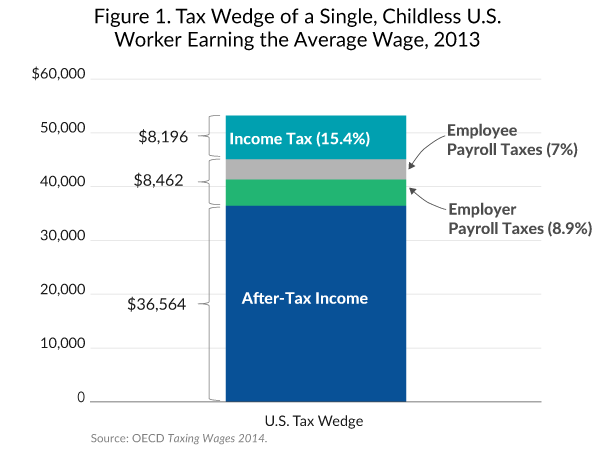 The average U.S. worker faces a tax burden of 31.3 percent. This includes both income taxes and payrolls taxes. Between these two types of taxes, the average U.S. workers pays over $16,000 in taxes on their labor. In total, the average worker pays $8,196 in income taxes and $8,462 in payroll taxes, which are meant to fund programs such as Social Security and Medicare. In the absence of the $16,658 in taxes and any benefits they provide, the average worker would take home $53,223 in income, as opposed to the current after-tax income of $36,564 for the average worker. To read more about the tax burden on U.S. labor as well as an international comparison, see here.